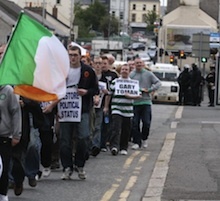 The march was held in solidarity with the republican prisoners in Maghaberry. But as it was reaching its destination, the PSNI blocked the route. The organisers of the march who had anticipated the PSNI tactics of the RUC then reverted to ‘plan B’ by taking a detour to circumvent the blockade. At this point, the PSNI tried to retrieve the situation and hastily set up another blockade, this was again evaded. A last ditch effort by the PSNI to relay to those present that the march was “illegal”. However, the march continued on its way, followed by a PSNI helicopter, reaching its final destination in Taghnevan estate. The Republican Network for Unity were among the groups that supported the march. The purpose of the event was “to call attention to the plight of Republican political prisoners and the pattern of repression now being inflicted by the British prison regime against these prisoners”, said the group’s spokesperson, Danny McBrearty. “Thirty years ago the British government under Thatcher forced a no-wash protest upon Republican prisoners in Long Kesh and Armagh,” he said. “Protests by human rights groups, clergy and Republicans were ignored, derided or dismissed. The British labeled these political prisoners criminals and said their suffering was self-inflicted. Gifted with opportunity upon opportunity to resolve the protest, the British instead blundered into the hunger strikes. “Today again Republican political prisoners have made reasonable demands that could be easily resolved by the British. Yet the conditions inflicted upon Republican prisoners are intensified. Maura McCrory, a former member of the Relatives Action Committee (RAC) and anti H-Block committee member chaired proceedings and introduced Gary Donnelly who read a statement on behalf of republican prisoners. Paul Duffy, a former republican prisoner and brother of Colin Duffy, also addressed those gathered. * Two people charged with an obscure public-order offence in relation to the sitdown protest in north Belfast on July 12 are believed to be the first people in the North to face the charge. Ardoyne man Martin Og Meehan and a 17-year-old who cannot be named because of his age were charged with ‘obstruction by sitting’ after being arrested during the protest.